Explore the North Island Auckland to Wellington on this short 'taster' tour. Rotorua, the cultural and adventure centre of the North Island plus the art deco city of Napier, wine regions of Hawkes Bay and the cosmopolitan capital city of Wellington will showcase the diversity on offer. Head out on the sparkling Waitemata Harbour and gain an insight into the city surrounds. This Cruise includes a complimentary return ticket to Devonport and a you'll also stop over at dormant volcano Rangitoto. Highlights of this tour include the iconic Harbour Bridge, the city skyline and Devonport’s historic naval base. You'll also see Bean Rock Lighthouse while enjoying morning or afternoon tea (a hot drink and a muffin). The harbour cruise lasts one and half hours and departs daily from the Downtown Ferry Terminal at 10:30am and 1:30pm. Your free return ticket to Devonport can be used whenever you like - it doesn't have to be the same day. Hop across the harbour to Auckland's ‘marine suburb' and spend some time exploring its delightful shops, cafes and galleries. The Grape Escape Half Day Wine Tour visits some of Hawke's Bay's most famous wineries and is designed for casual wine appreciators and wine aficionados. Meet like-minded people and share an appreciation of Hawke's Bay's fantastic wines. You will taste great wines made with passion and learn of the areas unique growing conditions. There is the opportunity to purchase and take home your favourite wines and memories. You will visit 4 to 5 local wineries and taste Syrah, Merlot, Chardonnay, Sauvignon Blanc and much more. Also try some of New Zealand's finest cheeses matched with wine. As you leave the rolling countryside of the Hawke's Bay you'll be greeted with some of the country's richest dairy farmland in the Manawatu Gorge. Continue on through the Wairarapa region and stop in the Pukaha Mount Bruce Wildlife Centre, where you can see some of New Zealand native animals.Take another break in Masterson, and visit the interactive Woolshed Museum to learn about sheep farming in New Zealand. As you drive south, a visit to historic Greytown is a must do. Take in the restored Victorian buildings and make time for a cup of tea at one of its quaint cafes. Leaving state highway 2 you will cross over the Ruamahanga River into Martinborough wine country - your destination for the day. Today you will cross the Rimutaka Ranges as you make your way to New Zealand's capital city, Wellington. Often compared to Melbourne, Wellington is vibrant cultural hub.Home to the nation’s centre of government. Legislation happens in the aptly named ‘Beehive,’ an executive wing attached to the Houses of Parliament. At one kilometre squared, the city centre (easily traversed on foot) has an international feel and is peppered with underground art shows, alleyway cafes and New York style delis. Take in the boardwalk view as you stroll to Te Papa Museum or indulge your cinematic side exploring Weta Workshop, the Oscar Award winning design studio for Lord Of The Rings. For a taste of vintage fashion, spend some time (and dollars!) on Cuba Street browsing the boutiques. Work off last night’s dinner with a cycling tour of Oriental Bay and undo your good work with a Hokey Pokey ice-cream in the sun. 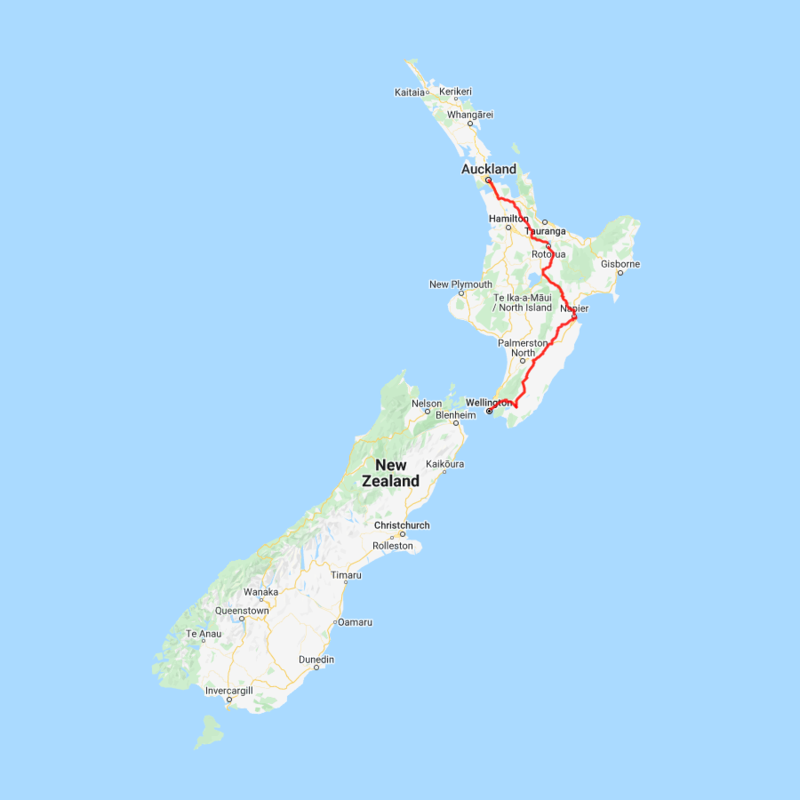 For those heading further down, the capital is where you board the ferry crossing the Cook Strait to the South Island. Drop your vehicle at the Wellington Airport rental car depot today before continuing your onward journey.